It’s impossible to apply Twitter best practices across all segments of the nonprofit sector because of the wide variety of causes and follower counts, but scientific analysis of Twitter clearly indicate that there is right way and a wrong way to use Twitter. The challenge is for nonprofits to learn from and apply the scientific data to their Twitter strategy. If you study Twitter and grow to enjoy using it, then your time invested will eventually pay off through increased brand recognition, referral traffic, new donors, volunteers, and event attendees. 1. Give your followers useful, interesting, retweetable content. A highly retweeted tweet posted by @Oxfam, this tweet taps into the power of statistics, the popular issue of income inequality, and includes a unique visual that helps the tweet stand out from the clutter. 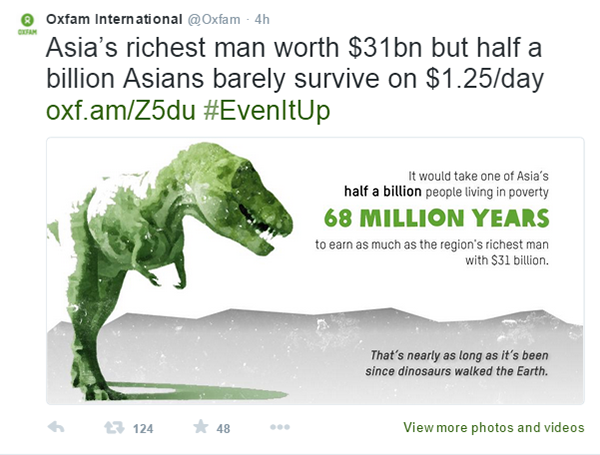 By prioritizing content related to their cause, @Oxfam is consistently retweeted, thus promoted by their followers. A nonprofit that prioritizes getting retweeted by sharing unique, interesting content is much more successful on Twitter than those overloading their account with fundraising asks and self-promotional tweets. 2. Write tweets in clear, concise language – no abbreviations and always use proper punctuation. Over the last 6 years, @NonprofitOrgs has tweeted more than 12,000 tweets and over that time two best practices have revealed themselves and consistently proven themselves to be true. First, tweets that are written in complete sentences without abbreviations and therefore easy to read are retweeted much more often. Second, tweets that end in either a period or a colon before the link are also retweeted more often and thus tend to have higher click-through rates. A messy, overloaded tweet just isn’t worth tweeting. Take the time to format tweets properly. 3. Curate good content through retweets. @OnGood is an online fundraising portal for NGOs worldwide. Rather than only tweeting about its services, @OnGood curates good content tweeted by other NGOs by retweeting their tweets. This strategy adds variety to their feed, engages their followers, builds credibility with the NGO sector, and eliminates the risk of appearing to over-market their services by only tweeting about themselves. Only a tiny portion of nonprofits create enough quality content to be able to only tweet their own content, so curating other content through retweets is a wise Twitter strategy with many benefits. 4. Tweet or retweet 2-8 times daily spread throughout the day. Sending more than one tweet every hour significantly decreases your click-though rate, according to social media scientist @DanZarrella. Experimentation with tweet and retweet frequency by @NonprofitOrgs has confirmed this to be true. At minimum, a nonprofit must tweet or retweet at least twice daily to gain traction on Twitter. Nonprofits that are more active should keep in mind the data below. If your nonprofit tweets more than once an hour, try pulling back and studying the results to find your optimal tweet-retweet rate. 5. Tweet on the weekends. The vast majority of brands do not tweet on the weekends which is why its much easier to stand out on the weekends. Using a tool like Buffer, you can schedule tweets in advance without actually having to work on the weekends. Schedule at least one tweet each Saturday and Sunday. Buffer also enables nonprofits that want to build an international following to tweet on 24-hour schedule. 6. Always include a link in your tweets. Tweets with links have an 86% higher retweet rate. This data speaks to the fact that Twitteres rarely retweet informal conversation tweets (unless posted by celebrities) and that nonprofits should embrace a retweet strategy of posting quality content with links to content sources, such as news articles, blog posts, etc. For example,@OneGreenPlanet recently tweeted a link to a call-to-action page to help Mali the elephant. Had they not included a link, this tweet would have had significantly fewer retweets.